Artist’s conception of Nanosail-D deployed in Earth’s obit (Credits: NASA). The experimental solarsail called Nanosail-D developed by NASA (Marshall Space Flight Center and Ames Research Center) is a fascinating object in our night sky. 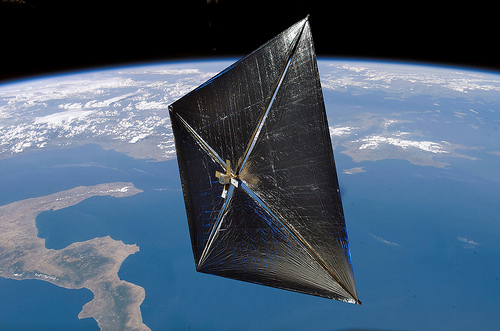 Although it is described as a solarsail which is originally meant to propel on radiation pressure of the sun, its main function is to experiment how such sails could be used with future satellites and space debris to increase the drag, resulting in a faster deorbit, one of the current techniques in development for future space safety technologies. Nanosail-D is in orbit since 20 November 2010. However, its separation from FASTSAT (Fast, Affordable, Science and Technology Satellite) occurred later than expected because of an ejection failure. On 19 January 2011 the separation happened unexpectedly and the experiment could continue. With the help of radio amateurs around the world, confirmation was quickly collected that the sail indeed deployed. 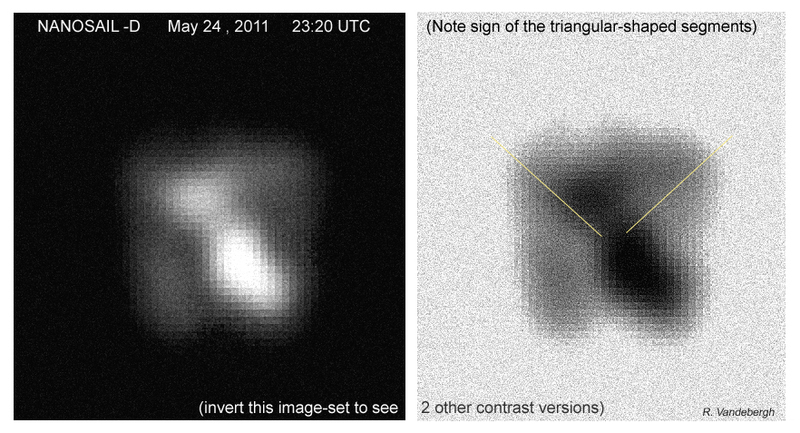 Now it was time for a first visual confirmation of a deployed sail, so an optical image. With the resources in-house, I participated in this effort and my first attempts to observe the sail started around February this year but failed. The sail turned out to be no easy object; it failed to adhere to the predictions. It sometimes emerged shortly during a session but was very faint and it disappeared again after a few seconds. It strongly looked like Nanosail-D was tumbling. Suddenly, late April during one of the many new attempts, it finally appeared as a favorable object in the southeast. Apparently I now had the luck of a favorable angle of the sail with the sun towards the observer. I managed to grab some first images and those had a nice obvious blue or cyan color, which is probably reflected Earth light, as the sail’s reflectivity is very high. In April, the brightness of the sail only varied slowly during the pass, I suspect it was slowly tumbling but the frequency of this rotation would quickly increase as it showed a great and irregular flashing appearance in May. The movie shows the behave of the sail according to gathered data taken May 24. The images shown in the set are from this session and show surprising detail in the sail. We even see a sign of the 4 triangular segments. Those appear to reflect the sunlight each in a slightly different direction, with the result of showing differences in brightness over the surface of the sail. The level of imaging becomes clear when we consider the ratio: A square with dimensions of 3 by 3 meters seen from a distance of in this case 667 kilometers. The images are taken in secondary focus of a 10 inch aperture reflecting telescope using manually tracking. The later attempts to take new images during later observing windows, including the most recent one this month, failed again, but this could be due to not-updated orbital elements. This is not cleared up at the moment of writing. In any case, the original average altitude of Nanosail-D which was around 640 kilometers, has lowered considerably since its launch. You can track Nanosail-D in real time at 2yo.com. Movie made of frames taken during Nanosail-D’s tumbling pass on May 24. Nice article and nice capture, Ralf.